It could take a lot of effort to pull together the perfect ensemble, but with the Bella + Canvas 8815 Women's Flowy Simple V-Neck T-Shirt, you can transition from daytime activities to after work hours with ease. With modern color palettes and finishes like triblend, solid and marble, you can select a flattering V-neck tee that is appropriate as a basic piece to dress up, then wear standalone when you go to walk the dogs or meet your date at the movies. Whatever your activity, this shirt will keep you cozy, confident, and prepared. 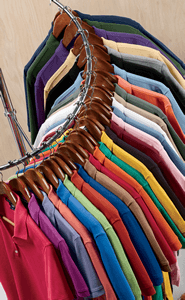 The fabric blends of these shirts vary, but are always comprised of the best fibers required for optimal softness and durability. The slightly longer length means that you can move as much as you want without fretting. An understated curved bottom hem causes the drapey silhouette of this shirt to finish in a flattering manner, adding a modern flair to balance the classic V-neckline.